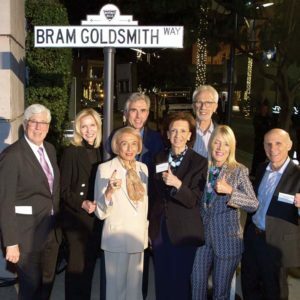 To celebrate the contributions of Bram Goldsmith to the Beverly Hills community, the City Council officially designated a public alley between the 400 blocks of North Roxbury and Bedford drives as “Bram Goldsmith Way” during a ceremony on Nov. 7. The longtime Beverly Hills resident was a builder, banker and philanthropist, and played a leading role in the growth of the city. Goldsmith helped construct 30 buildings along Wilshire Boulevard in Los Angeles, including the headquarters of the Academy of Motion Pictures Arts and Sciences. Known as “Banker to the Stars,” from 1975-1995, Goldsmith served as CEO and chairman of City National Bank and continued as chairman until 2015. He played a leadership role in several charitable organizations, including the Jewish Federation Council of Greater Los Angeles, the Los Angeles Philharmonic Association, the United Way and the National Conference of Christians and Jews. Goldsmith died in 2016 at age 93. Beverly Hills Mayor Julian Gold, members of the City Council and the Goldsmith family were in attendance.